The shaded relief layer highlights features on the seabed using light and shade. Change the default altitude, azimuth and vertical exaggeration using form below. The bathymetry shows the depth of the seabed using a graduated colour scale. 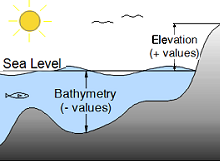 Bathymetry values are negative and elevation values (from LiDAR surveys) are positive above sea level. Change the range of values displayed and colour scale using form above.